Eggnog, have you ever tried it? I used to give that question a big no until I made a batch of it for this Christmas! Wondering why I had never made or even tasted eggnog before? Well here in Australia, eggnog hasn’t been that popular or even considered a Christmas dessert/beverage, well at least for me growing up. I always saw people throughout the United States enjoy eggnog during the festive season but was never curious enough to give it a go. If I’m being completey honest with you, I was a little turned off by drinking a beverage made of eggs. Once I did a little research though, to me, it sounded much like a drinkable custard and I lovveeee custard, so I gave it a go! I was relieved to find out how simple eggnog was to make and I refer to it as a drinkable custard because the method in which it’s made, is very similar to how a basic custard is made. This eggnog will be enjoyed this festive season by many of you I hope! It’s under 10-ingredients, filled with the classic Christmas spices of clove, nutmeg and cinnamon. It’s rich, creamy and delicious. The best part? Brandy! 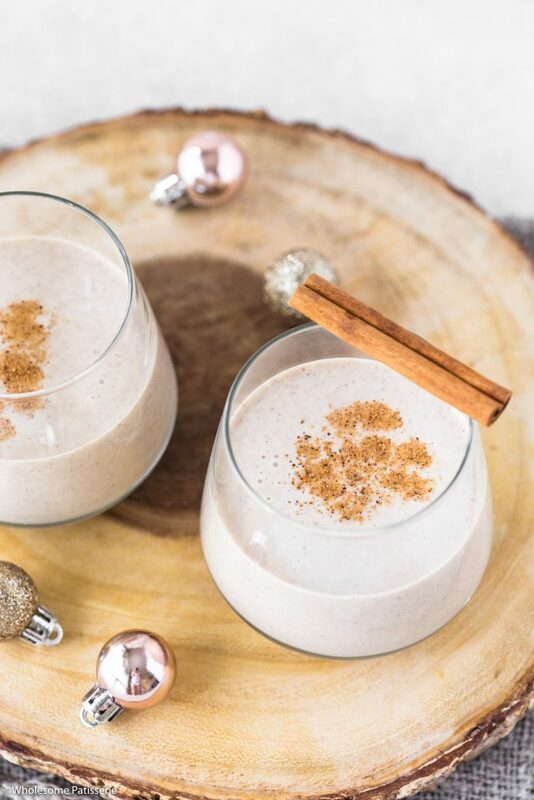 Of yes, brandy is a staple in many Christmas desserts and this eggnog is no exception. 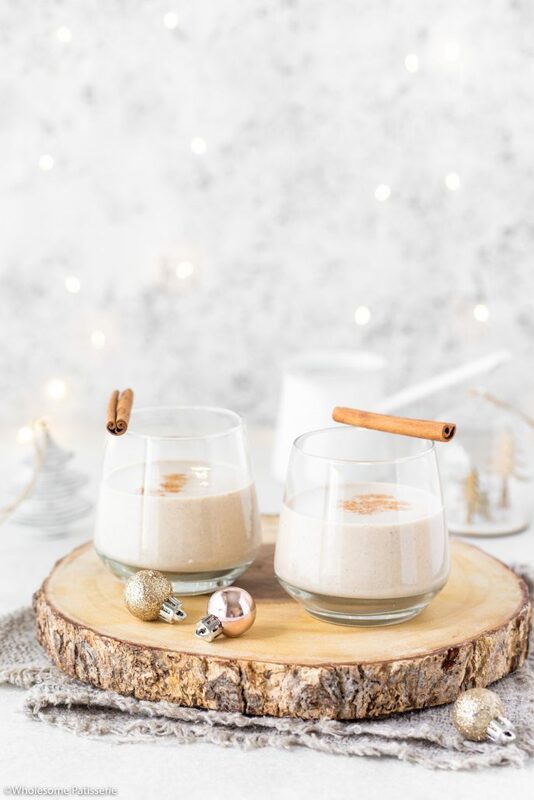 The choice is completely up to you, you can leave the brandy out altogether, especially if your little ones are going to be indulging in the eggnog. Or you can add a little brandy or a decent amount of brandy. Just taste test the eggnog along the way when adding in the alcohol. I hear rum is also wonderful in eggnog! 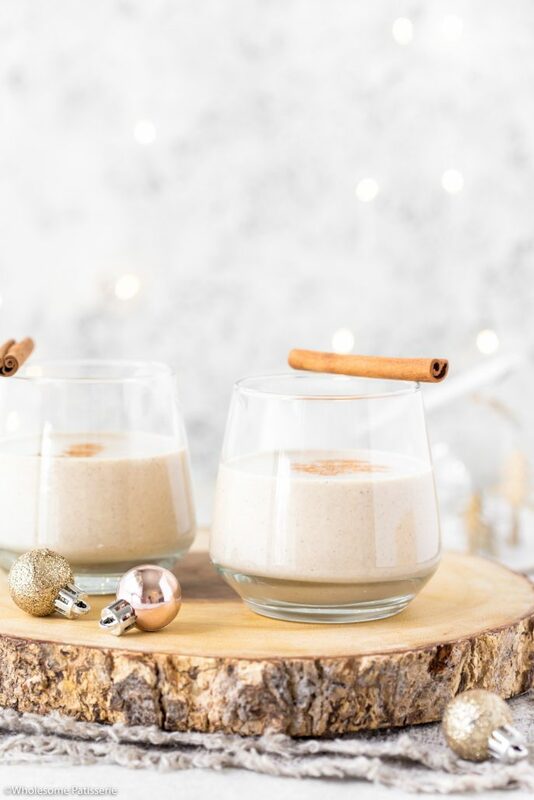 This eggnog recipe can be made the day before you’re going to be serving it, as it does have to set in your refrigerator overnight. So this makes for a perfect prep dessert! 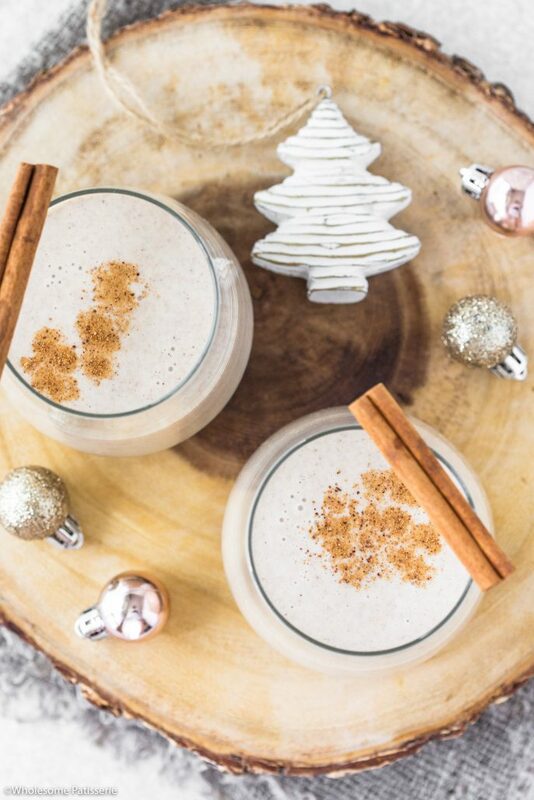 You can also double or triple this eggnog recipe to serve a larger group of guests. 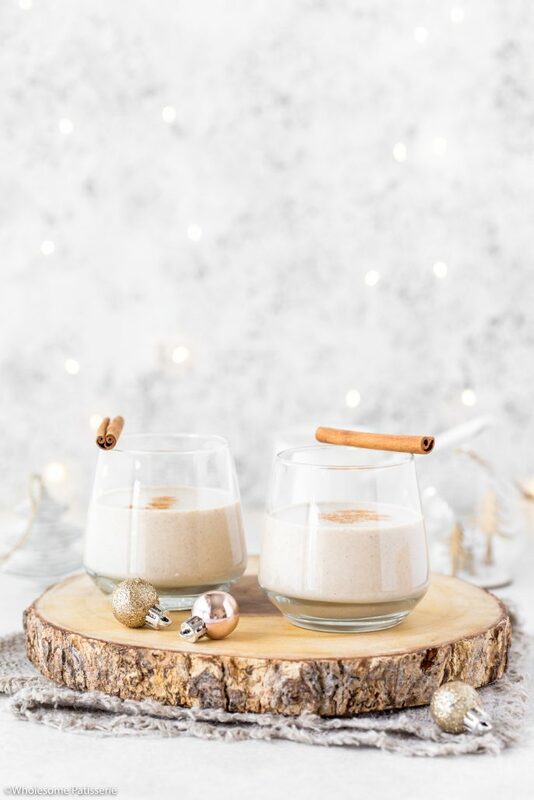 I hope you’re going to enjoy this homemade Christmas eggnog recipe friends, it’s certainly indulgent! In a large heat-proof mixing bowl, add egg yolks and sugar. Whisk together until light, creamy and fluffy, approx. 20 seconds-30 seconds. Set aside. In a medium sized pot over medium heat, combine milk, ground clove, cinnamon and vanilla. Mix to combine well. Heat milk mixture until steam begins to come off the surface, do not let it come to a boil. Once heated through, remove from heat. Bring back your whisked egg yolks, slowly and gradually stream a little at a time of the heated milk into the egg yolks, whisking egg mixture vigorously while pouring. NOTE: doing this slowly is crucial, as you’re tempering the egg, done too fast will heat and cook the egg. Stream a little in at a time, whisking well after each addition. Once all the milk has been added to the eggs, pour the combined mixture back into the pot. Place over a low-medium heat and stir constantly until mixture slightly thickens, approx. 3-4 minutes, not letting it boil. Mixture should resemble a thin pourable custard. Once thickened, remove from heat and strain mixture through a fine mesh sieve into a clean heat-proof mixing bowl. Let mixture cool for 1 hour at room temperature. Once cooled down, whisk through cream, nutmeg and brandy, if desired. If using brandy, add a tablespoon at a time until desired flavour. Pour eggnog into a large glass mason jar or jug fitted with a tight lid. Set in the refrigerator overnight. 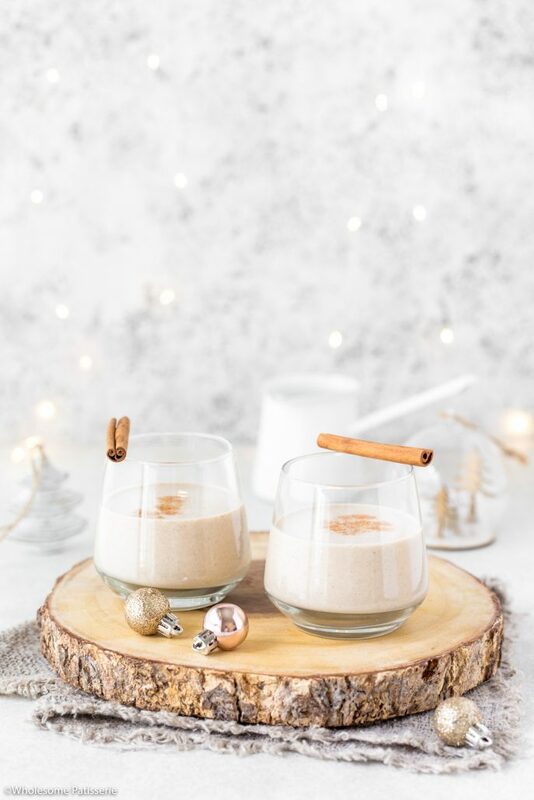 This eggnog can be made the day before serving, as it has to set in the refrigerator overnight. Eggnog will keep in an airtight glass jar, refrigerated, for 2-3 days. *This recipe was adapted from Genius Kitchen.